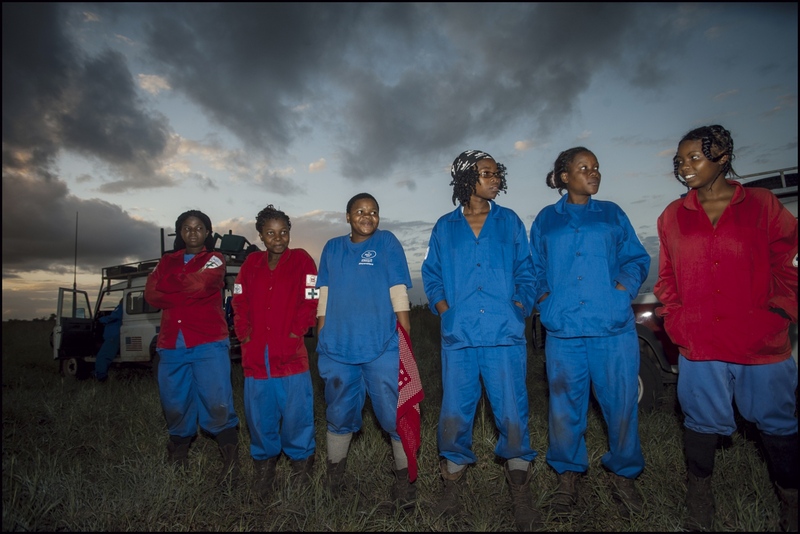 Craig Stennett Photojournalist | Women De-Miners, Mozambique. Helen Gray Programme Manager for The HALO trust in Mozambique with the women's section in Damo minefield, Maputo Province, Mozambique. Deployment day at the HALO head quarters compound in Zimpeto, Maputo, Mozambique. L-R Women section De Miners Amelia Zulmira (21), Helena Wetela (28) and Luisa Chelene (29) load up their landrover before travelling to Damo camp. The Team Deployment Board at HALO's Zimpeto compound, Maputo, Mozambique. Land Mine idenyification liturature at Zimpeto compound. HALO usually deal with Anti Personnel Blast Mines, Fragmentation Mines, Anti Personnel Bounding Fragmentation Mine, Claymoore Fragmenting Directional Mines Anti Tank Mines and other unexploded ordnance. Deployment day. HALO Deminers leave Zimpeto compound in Maputo to travel to their minefields. They will not return for 21 days. Living and working at the minefield. 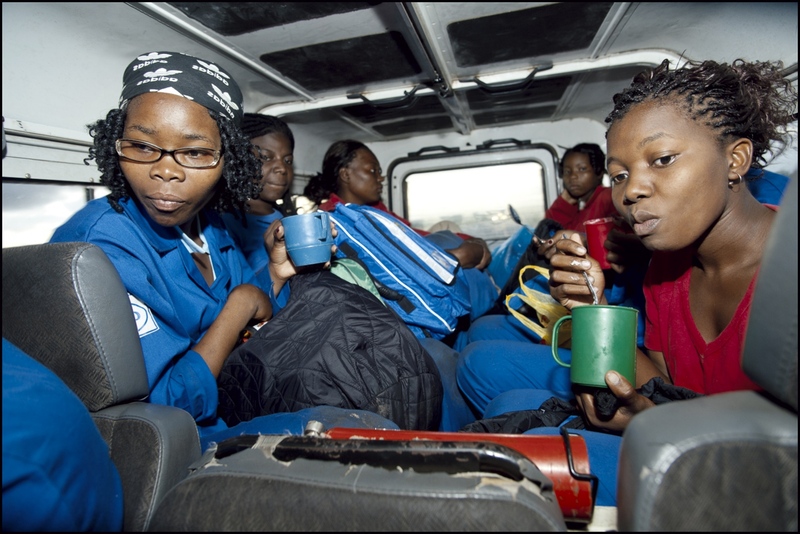 The Women's section deploy at 6am in Damo minefield, Maputo Province, Mozambique. HALO programme Manager Helen Gray checking paperwork at Damo minefield with Supervisor Arcillia Adriano. Maputo Province, Mozambique. HALO Supervisor Arcillia Adriano discusses the approach they should take at Damo minefield with deminer Matilde Fatima. Maputo Province, Mozambique. Single mother 22 Year Old Sheila Marisa da Assuncao Chiponde has a 4 year old boy. " Some of my family still don't believe that i'm a deminer and that i work in MInefields. "Damo Camp, Maputo Province, Mozambique. Demining in Damo minefield Maputo Province, Mozambique. Preparing for a days demining in Damo minefield Maputo Province, Mozambique. Damo Camp Maputo Province, Mozambique. 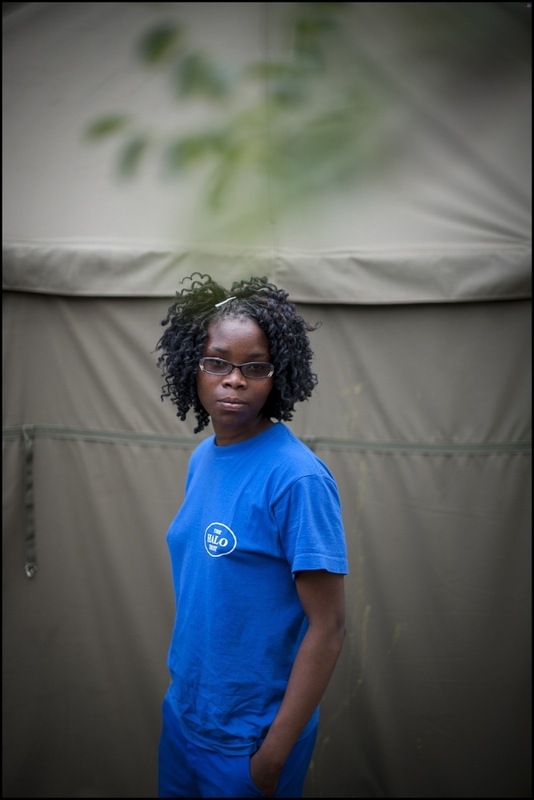 Section Commander Ercilia da Fatima in Damo minefield Maputo Province, Mozambique. Relaxing in their tents in the evening, the womens section sing and dance to a popular Brazilian love song at Damo Camp Maputo Province, Mozambique. Breakfast while on the road to the minefield from their camp at 5.30am leaving Damo Camp, Maputo Province, Mozambique. 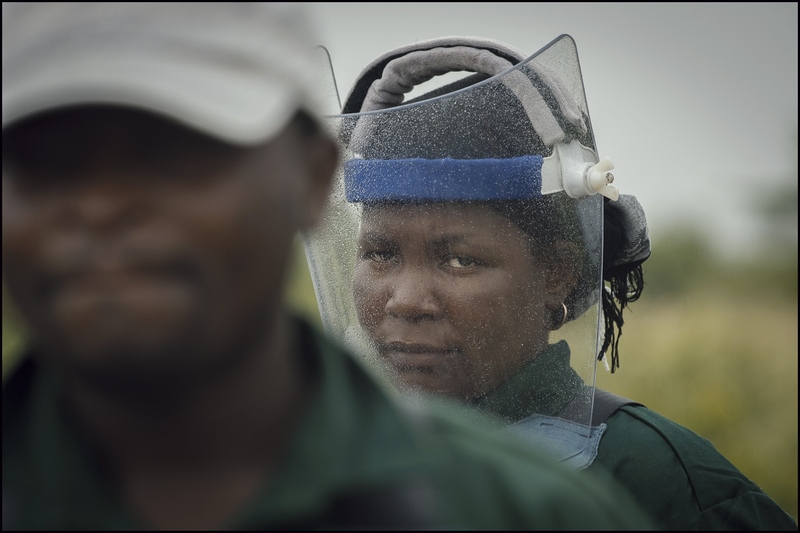 HALO Paramedic and Deminer Helena Jaime Luis in Damo minefield Maputo Province, Mozambique. 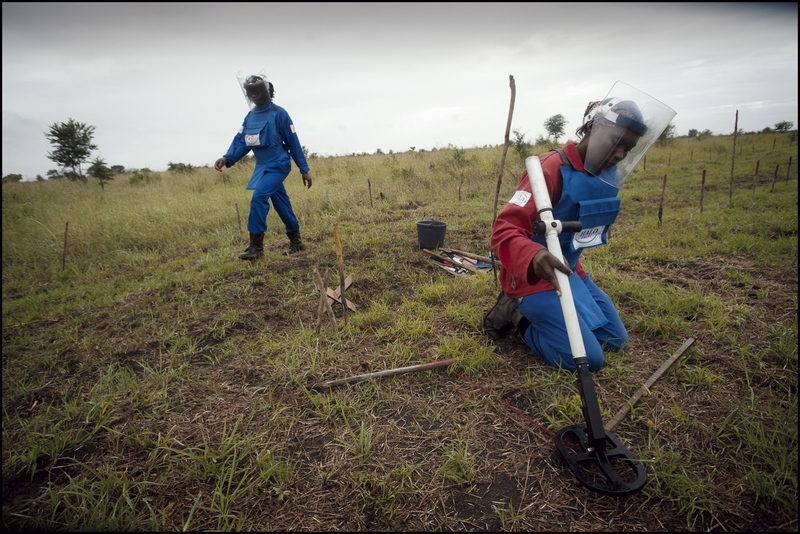 Each morning the deminers run through their drill in a "dummy" minefield. It reminds each section that Standard Operating Procedures are essential for safety. 6am at"Damo" minefield, Maputo Province, Mozambique. Demining stops due to the rain limiting visibility in Damo minefield Maputo Province, Mozambique. 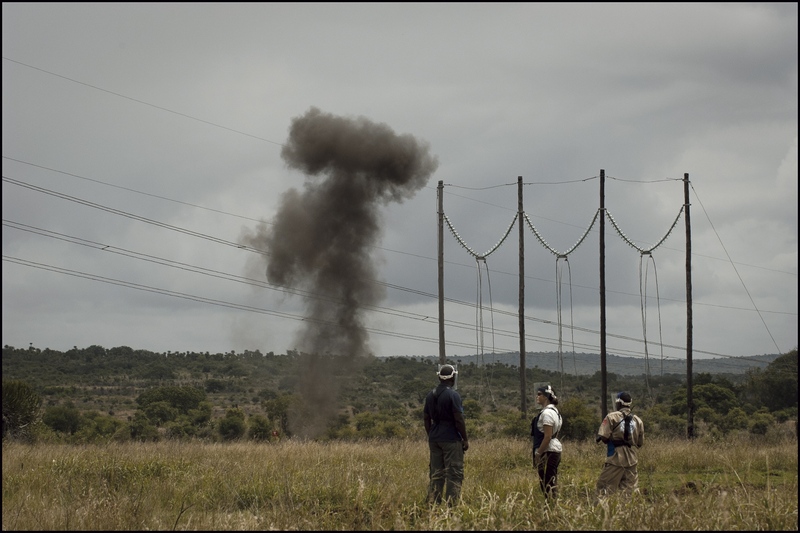 A Russian Federation PMN Anti Peesonnel Blast Mine detected by HALO deminers at Mubobo minefield, Maputo Province, Mozambique. Laid some 30 years ago the mine's still remain active it was later destroyed with a Pentolite charge. HALO Supervisor Arcillia Adriano (centre) was called to a site near Damo minefield where a 28 year old cattle herder had his leg blown off by a mine 3 days earlier. HALO will now survey this area also. She is accompanied by two other HALO deminers and Paulino D'Uambo (far left) who was the cattle herders boss and brought the situation to HALO's attention. Maputo Province, Mozambique. 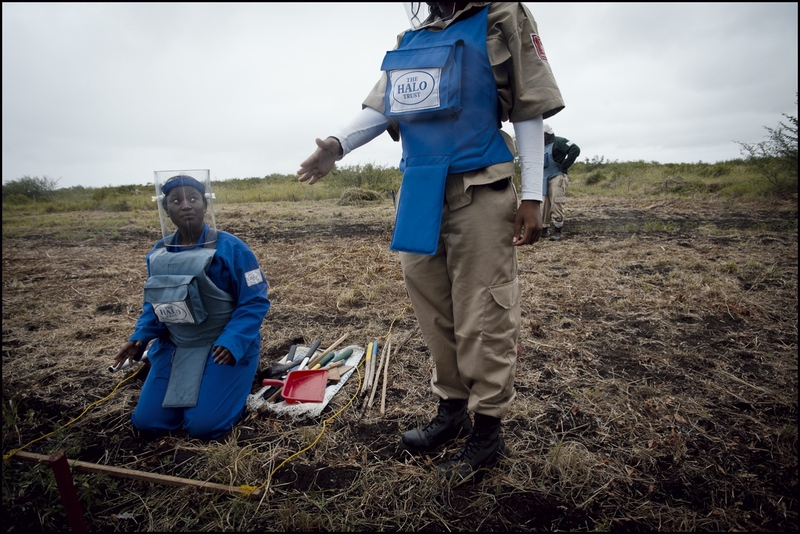 Supervisor 28 year old Domingas Lacrimosa Lina Dias demining in Damo minefield Maputo Province, Mozambique. Helen Gray Programme Manager for The HALO Trust in Mozambique shows the Pentolite charge that will be used to destroy a Russian Federation PMN mine at Mubobo minefield, Maputo Province, Mozambique. Casualty of the minefield. The victim had probably been alone scavenging for metal to sell when he set off one of the mines. L-R: HALO Operation Manager Lordes Zavale with Programme Manager Helen Gray and Supervisor Onorio Manuel watch the Pentolite chare set off the PMN Anti Personnel Blast Mine in Mubobo minefield, Maputo Province, Mozambique. Claudia Matsinhe a single mother with a 6 year old daughter " I am very proud of every woman who works in the minefield." 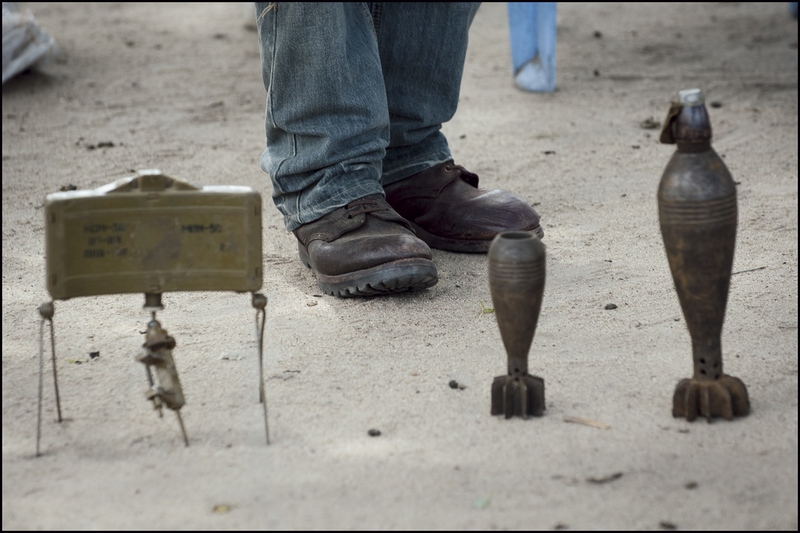 Demining in Damo minefield Maputo Province, Mozambique. Survey Supervisor Aziz Faria (33) shows a group photograph he has just taken of them at Tlemo. They have just held a meeting where the village has self declared that it is mine free, the photograph and witness signatures is a record of this. 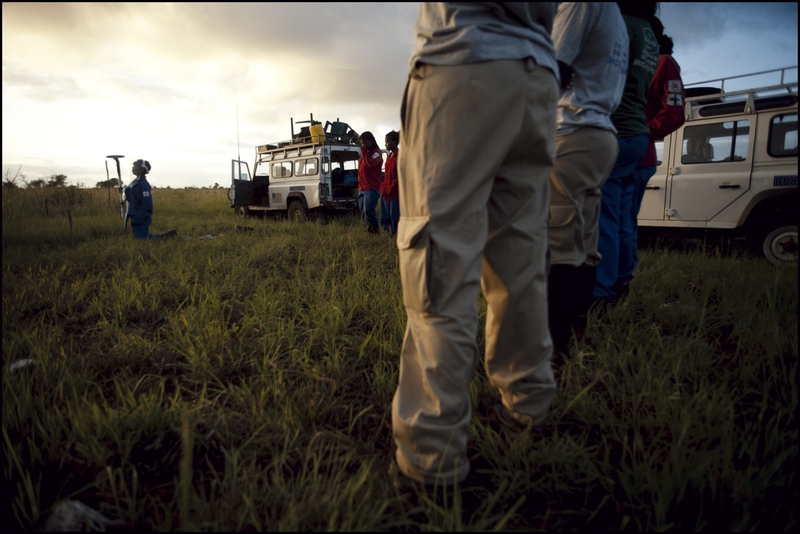 The HALO survey teams will visit every community in Mozambique to certify that all mines have been cleared. 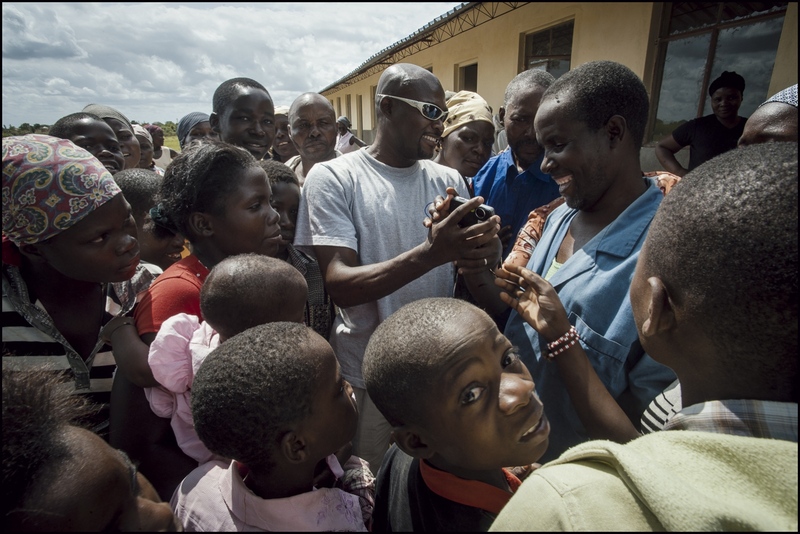 Survey Supervisor Aziz Faria (33) talks about the dangers of UXB's and mines to the villagers of Tlimo, Maputo Provice, Mozambique. Aziz is part of the survey team. 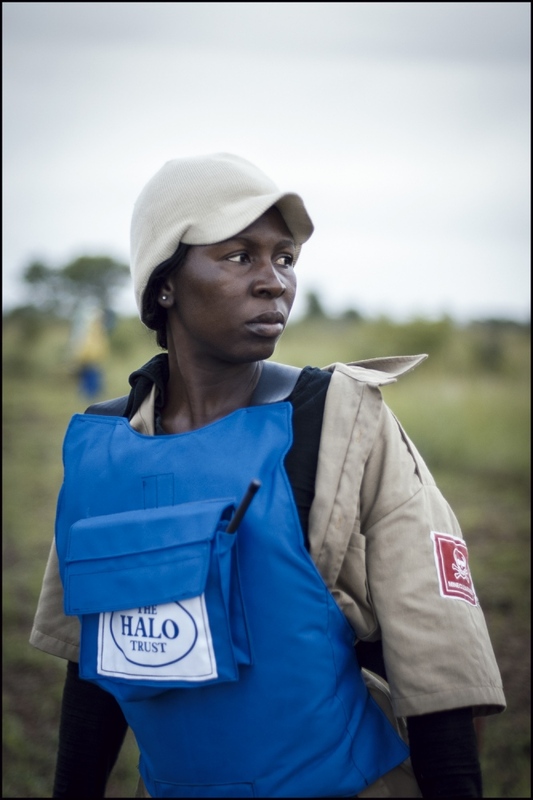 HALO's survey teams will visit every village in Mozambique to access if they are now mine free. 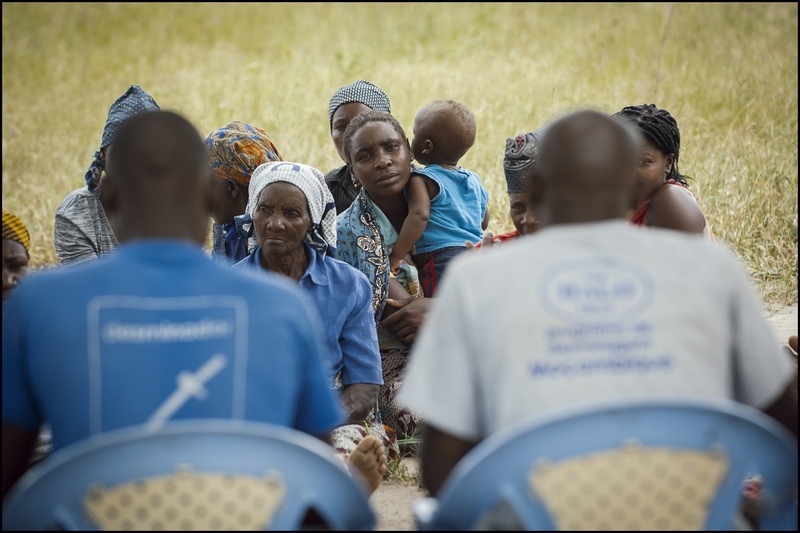 Survey Supervisor Aziz Faria (33) talks about the dangers of UXB's and mines to the villagers of Chobela, Maputo Provice, Mozambique. Aziz is part of the survey team. 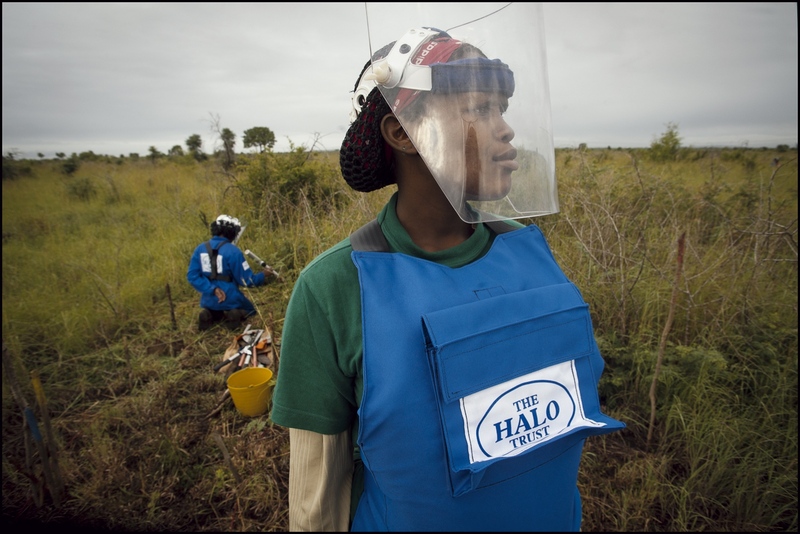 HALO's survey teams will visit every village in Mozambique to access if they are now mine free. Villagers from Chobela village listen to the survet teams talk on UXB' and mines and if there is still a problem in this vacinity. This village went on to self declare that it was mine free. 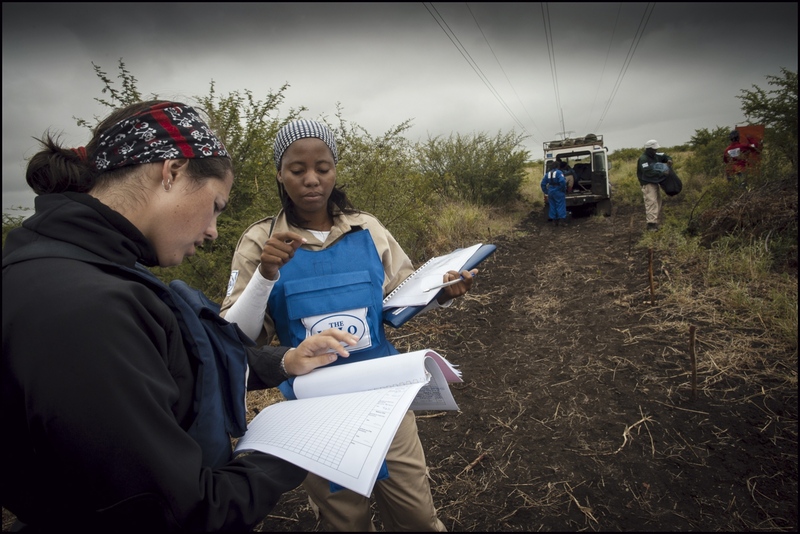 The HALO survey teams will visit every community in Mozambique to certify that all mines have been cleared. Villagers from Tlemo village listen to the survet teams talk on UXB' and mines and if there is still a problem in this vacinity. This village went on to self declare that it was mine free. 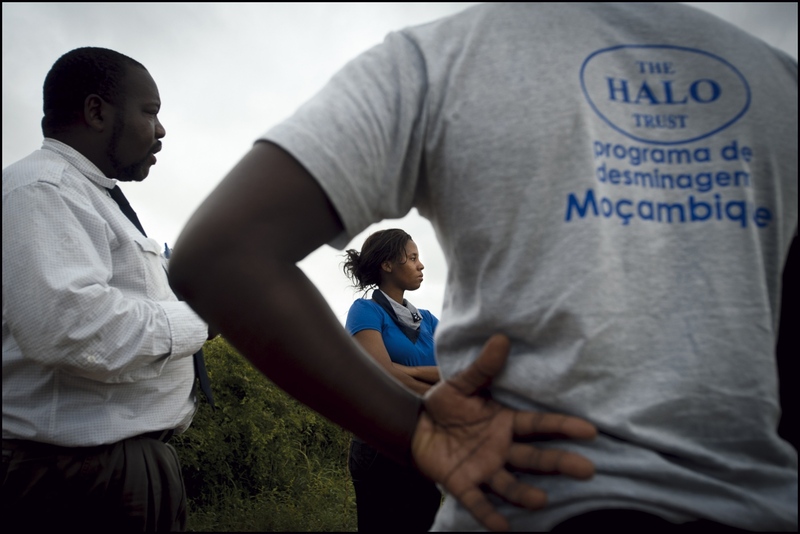 The HALO survey teams will visit every community in Mozambique to certify that all mines have been cleared. 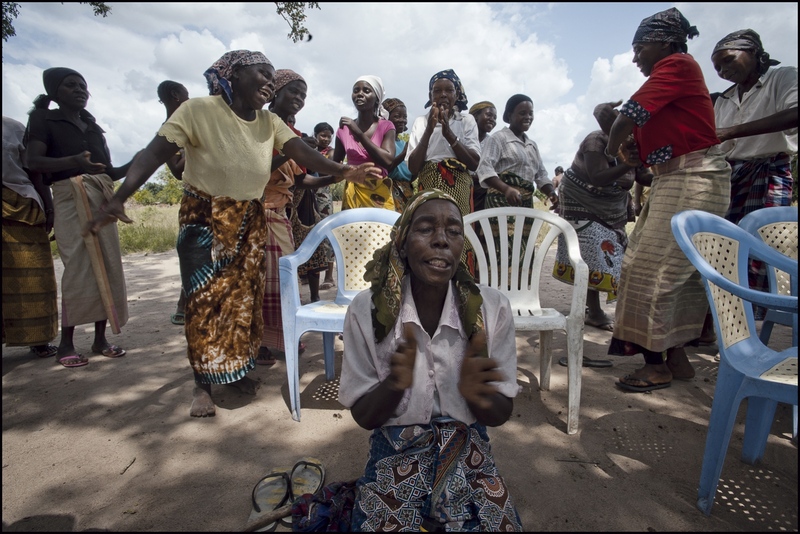 The villagers of Chobela, Maputo Provice, Mozambique celebrate the end of the meeting with HALO's survey team. 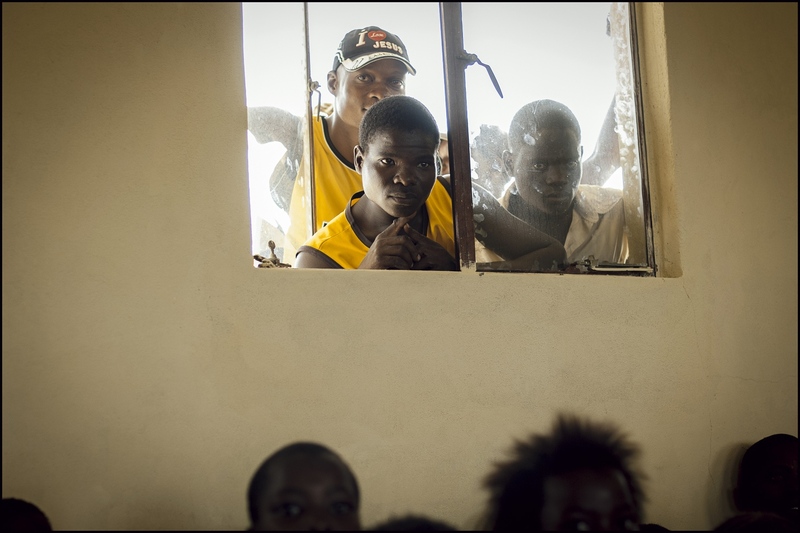 HALO's survey teams will visit every village in Mozambique to access if they are now mine free. 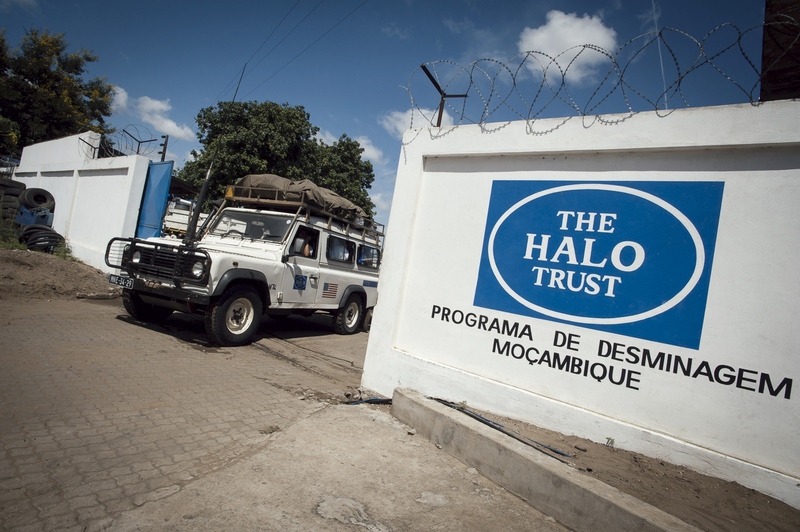 Deployment day at The HALO Trust's compound in Zimpeto district north Maputo, Mozambique, is fondly described in the national tongue of Portuguese as the day of "confusão". Fifteen of the twenty six demining sections have just returned from their 8 day leave and are about to embark on 3 weeks living and working in one of Mozambique’s remaining 139 minefields in what is widely acknowledged as one of the most dangerous jobs in the world, that of being a deminer. It’s still the rainy season but today there is nothing but brilliant sunshine and an intense wilting African heat. Helen Gray a 30 year old resourceful Scot raised on an East Lothian farm and educated at Geoge Watson's College in Edinburgh, now Programme Manager for Hazardous Area Life-Support Organisation, HALO for short, in Mozambique pulls into the compound in her Nissan pickup and surveys the scene. Leaving her vehicle and making her way across the compound on foot she is greeted by a blur of activity. Landrovers and Trucks are being refuelled, tents and sleeping bags are being loaded and stores are emptied of food and the essential demining kit the teams will need for the near month they spend in the field. 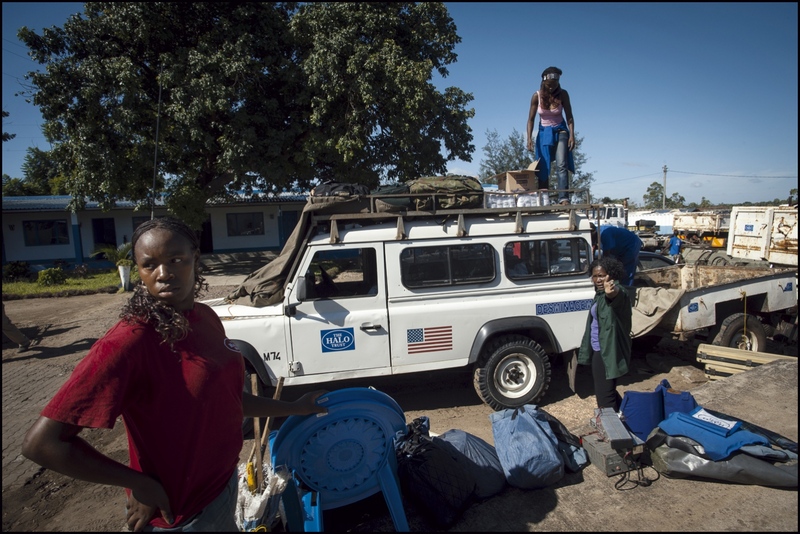 After several hours they're ready for their deployment throughout Maputo province and leave the relative safety of HALO's Head Quarters, being checked off by security guards as each vehicle drives out of the compound. Helen has just returned from taking Susan Eckey the Deputy Director General of the Norwegian Foreign Ministry and her accompanying delegation on a fact-finding mission in the HALO minefields. 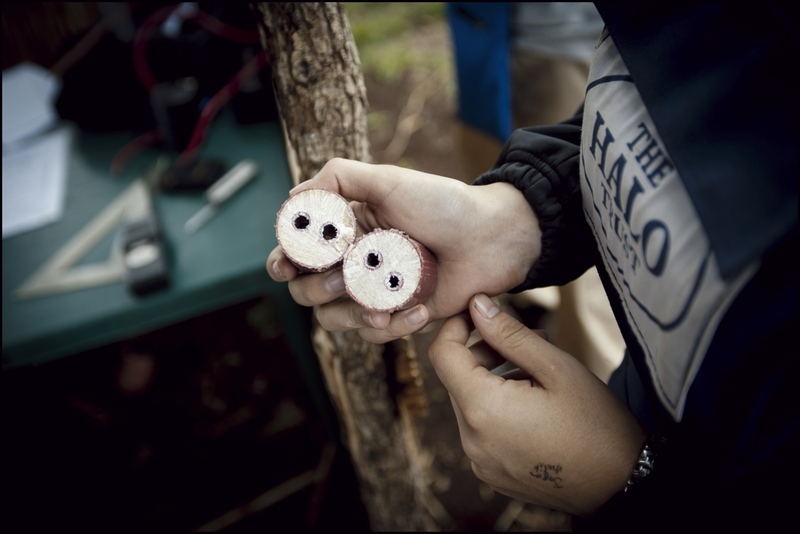 One of the two all women section's HALO employs had extended their days in the field demining to accommodate the Norwegians visit and will now re-deploy later in the week. HALO is a non-profit non-governmental organisation whose head office's are in Dumfries, Scotland. Its singular mandate is to remove landmines and un-exploded ordinance from all the nine countries it operates in. 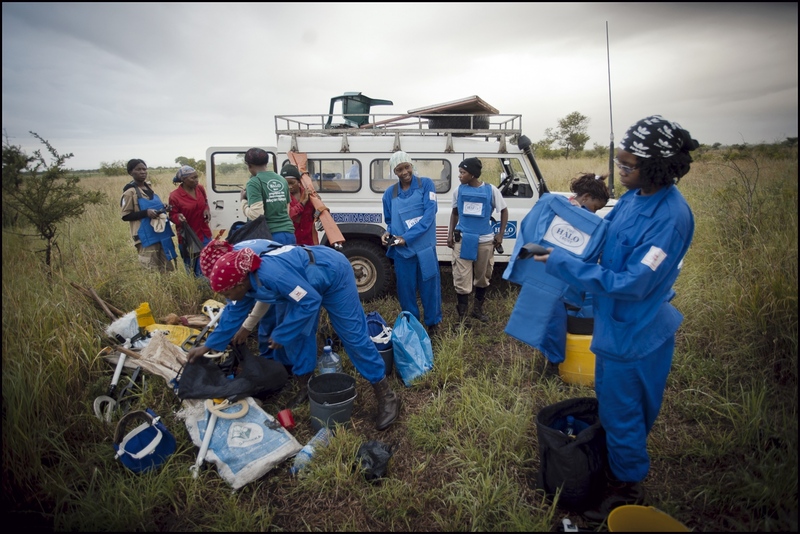 It deployed its first demining team in Mozambique on the 20th February 1994 and has now declared the countries six northern provinces mine free, leaving only the south to be dealt with. Helen Gray has worked for the organisation since 2004 doing her initial 6-month training in Cabo Delgado on the northern border of Mozambique on the big Portuguese mine fields laid back in the early 1970's, HALO removed 80,000 mines from this area alone. Then followed deployment to Angola. She returned to Mozambique in January 2008 and in Feb 2009 was tasked with running the country's operations with responsibility for all its 370 staff in their de-mining activities with an accompanying 3 million US dollar budget, only just over half of what she needs if Mozambique is to hit the 2014 target it has set itself to become completely mine free. After finishing her Bachelor of Science Degree in Biology and Anthropology at Durham University Gray worked as an environmental interpreter for the Scottish Sea Bird centre and then as an expedition's guide in Peru's threatened rainforests. On her return to Britain she speculatively sent her CV into HALO. Her neighbour had told her about the organisation and she had also decided herself that she wanted to now work with an NGO in a humanitarian field. "My job gives me tremendous satisfaction. It's brilliant to be able to deploy deminers into an area where there's a problem with minefields. After handing it back to the local community you can return in a couple of months and you can see maize growing there or there're houses or schools that have been built and the problem of mines has gone, forever. You don't get that level of reward from many jobs", Helen remarks. 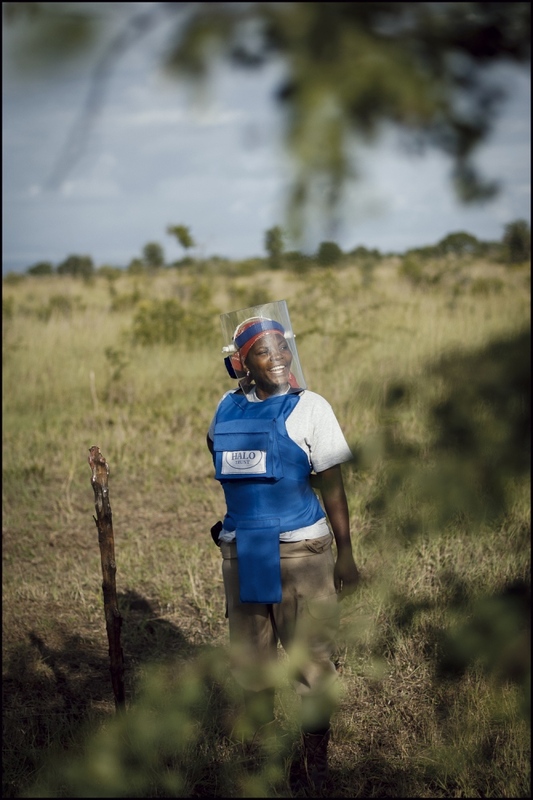 When prompted to recall day one in a minefield, she continues, "I remember my first day demining up on the northern border project between Mozambique and Tanzania and I really wanted to find a mine. The drill we learn is very systematic and repetitive and as I'd done all the training I didn’t want to spend 20 minutes after finding a metal signal carefully scrapping and excavating my way towards a coke can! I wanted to find a mine." Helen, as part of her job, has gone through all lthe apropriate levels of training within HALO. 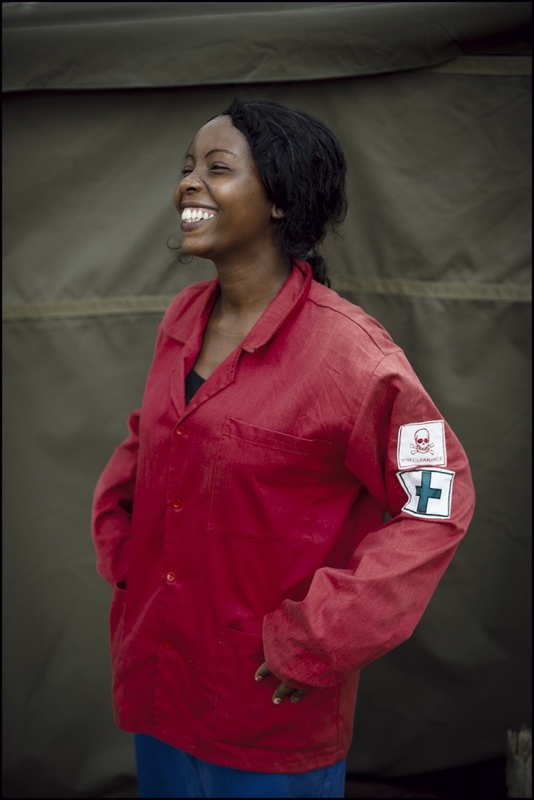 "Its better when your relating to the deminers, paramedics or mechanics that you've experienced there jobs yourself, first hand. You've been through the training and worked on the ground yourself." She adds "Discovering my first mine was a reality check. People stand on these and they loose their legs, they loose their lives. Mines are particularly horrible as they do not discriminate against old or young, male or female. They lie in the ground just waiting. I still to this day enter minefields and think my god whats the impact here. Whats that village doing so close." 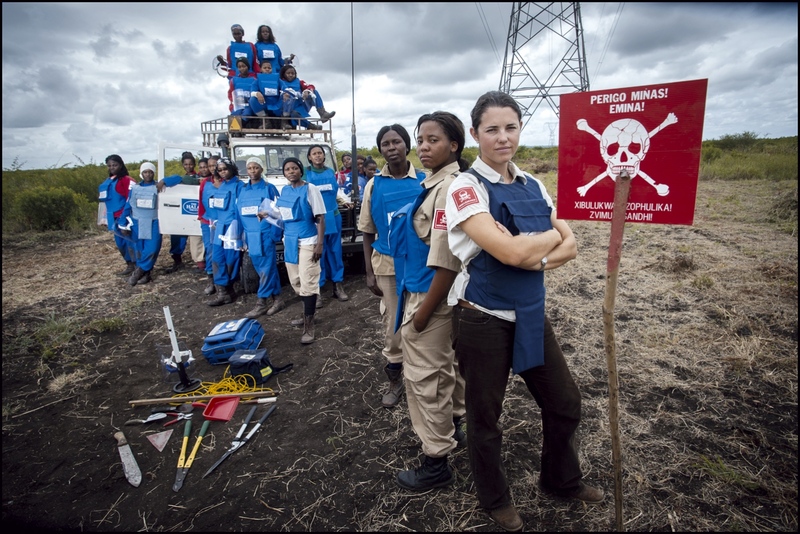 It’s this level of commitment that allows Helen and her staff to tackle the mine clearance Mozambique does so desperately need. A country that after 20 years of an initial armed liberation struggle with its colonial power Portugal was followed by an internal civil war between Frelimo, now the government, and Renamo which was secretly backed by Rhodesia and later South Africa. An effective cease-fire came into force between the warring factions on 15th October 1992 and it has stuck to this day. Its legacy however, was 900,000 deaths during the fighting, five million displaced persons and an estimated 200,000 landmines deployed by all sides in the conflict. HALO is probably most famously linked in the public’s collective memory with an iconic image of the late Princess Diana in a minefield. In January 1997, the last year of her life, Diana visited a HALO minefield on the outskirts of Huambo City in Angola. The images were seen worldwide and with the accompanying publicity the Princess brought to the issue of the use of land mines and the need for their clearance has been attributed with influencing the signing of the "Ottawa Treaty”, of which there are 156 signatories. 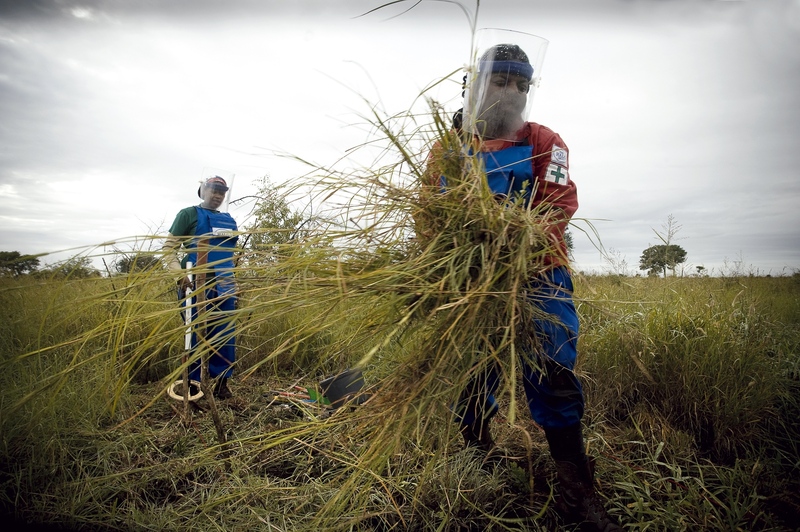 It created an international ban on the use of Anti Personnel Mines and the need for their removal from the 70 countries they still present a danger to. "Diana was visiting the International Committee of The Red Cross in Angola when they suggested to her that she should visit one of our minefields." Gray recalls. "The Princess brought fantastic visibility to the need for humanitarian mine clearance and the issue of mine use." Helen accompanied Diana's son Prince Harry last year (2010) as he visited the once densely laid minefield around the Cahora Bassa hydroelectric dam. 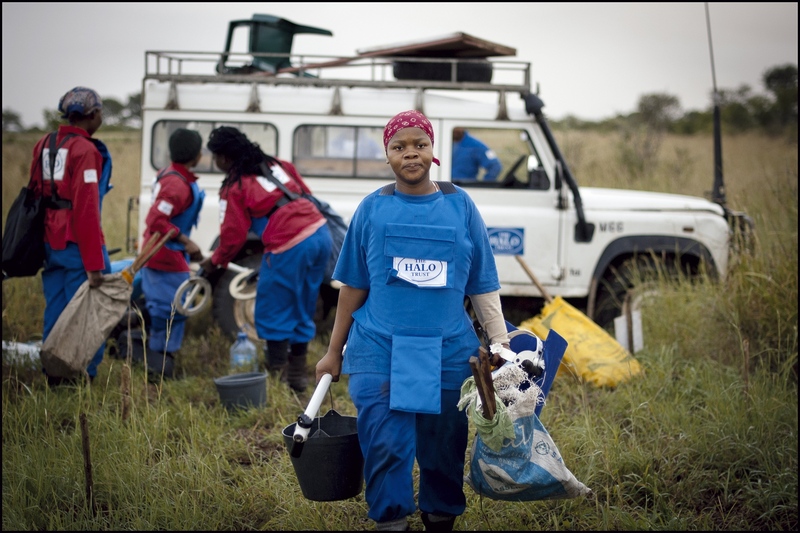 Helen had led the team which removed some 32,000 mines from this area. Re uniting villages that were literally cut in two by the deployment of the mines. " I spent two days with Prince Harry in Tete province showing him the work HALO had done to clear this incredibly dense mine line. He met the local community and victims of the mines and showed the same humanity and empathy his late mother was renowned for." Leaving the Zimpeta compound in the pickup Gray makes her way out of Maputo along cratered roads bent on the destruction of the Nissan's suspension and through dense traffic which adheres to an alternative highway code not practised in Scotland. A skill only mastered by drivers with a good visual awareness and nerves of steel. Qualities that Gray has in abundance. She eventually joins the well-maintained NRD EN4 highway west of Maputo, following the trail the de-mining teams took to their respective minefields the day before. Driving for an hour or so towards the South African border we arrive at one of the "Equipa de Meninas" minefields or "girl’s sections" as it translates. They are working in "Damo" minefield, the old electricity pylon route, its wooden structures long since crumbled into the earth. The 10 strong women's team has been awake since 4.30am as work starts in the minefields at first light at 6am finishing at 1 in the afternoon, with a 10 minute break every hour. Their sister team of another 10 women is close by, demining directly under the new high voltage electricity pylons. Their working day is dictated by the need to avoid the worst of the heat. Nevertheless temperatures can get up into the mid to late thirties producing a punishing environment in which it is hard to maintain physical strength and concentration - two elements crucial for deminers alongside strict adherence to all the operating procedures they have been trained to follow. The first women's section was formed within HALO in 2007. 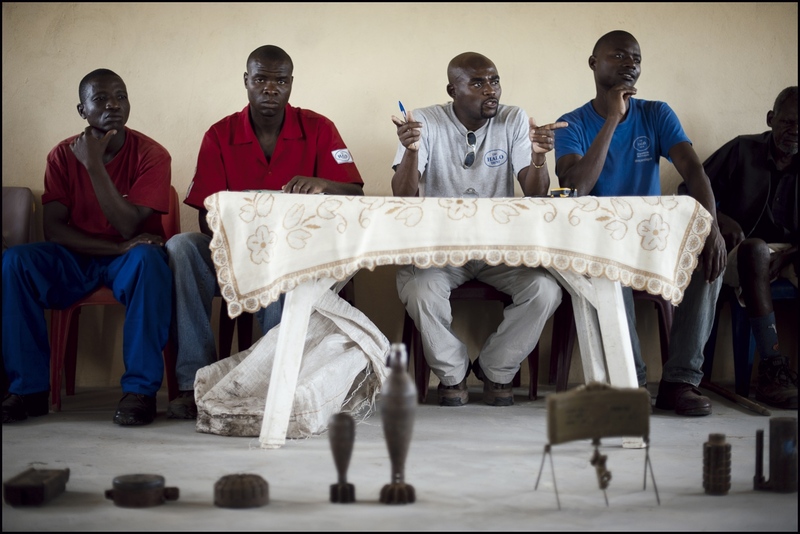 "The perception in Mozambique was that demining was a job done by men. When HALO was recruiting people we started to state quite clearly that applications were welcome from women and men and we found that many women applied. In the 2 years since the employment of women deminers began they have done incredibly well being promoted through our system" Gray explains. Twenty eight year old Supervisor Domingas Lacrimosa Lina Dias, a tall purposeful woman adds, "With us working here the country rids itself of mines. I feel proud to be doing this job of clearing mines as a woman. 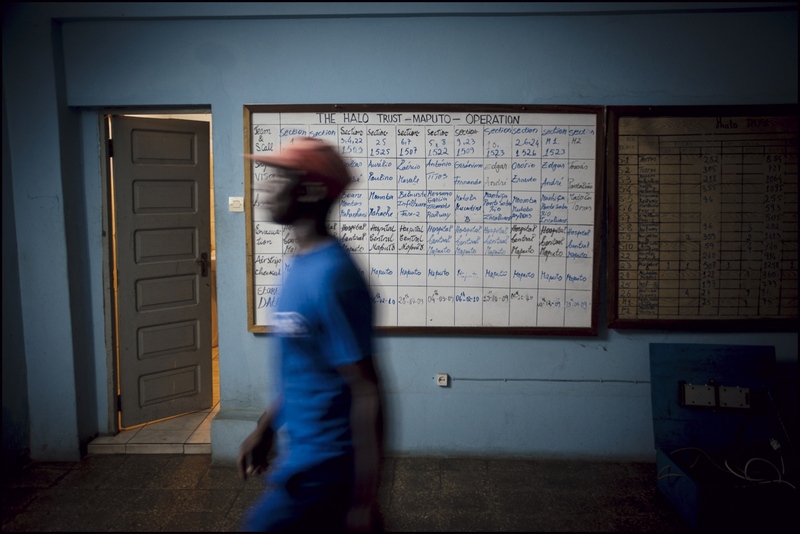 It was a job that in Mozambique was seen as men’s work but now I am proving different." 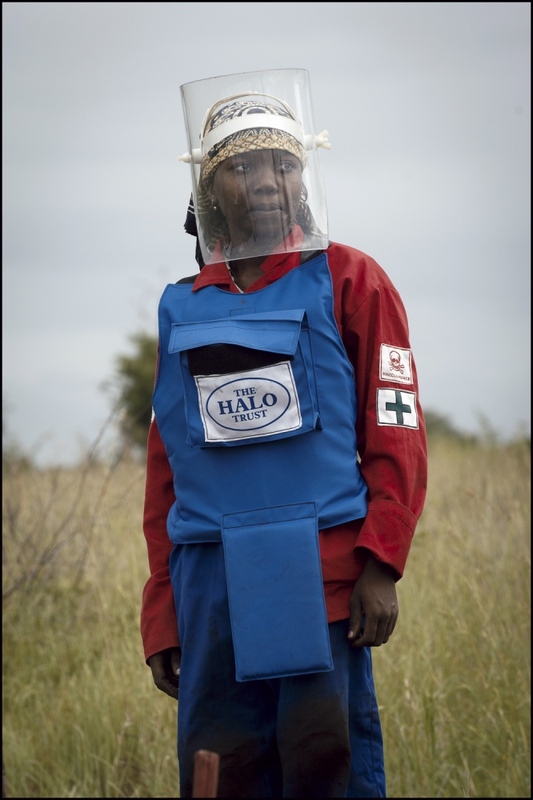 Helen's mobile is ringing; when she answers she is informed that they're ready for the destruction of a landmine at "Mubobo" minefield a few kilometres up the EN4. Mubobo is the most heavily mined area remaining in Maputo province. The Frelimo government laid it during the civil war to impede sabotage of the vital pylons providing the capital Maputo with its only electricity, supplied from the huge Cahora Bassa hydro electric dam. 22-year-old section supervisor Onorio Manuel meets Gray on our arrival. 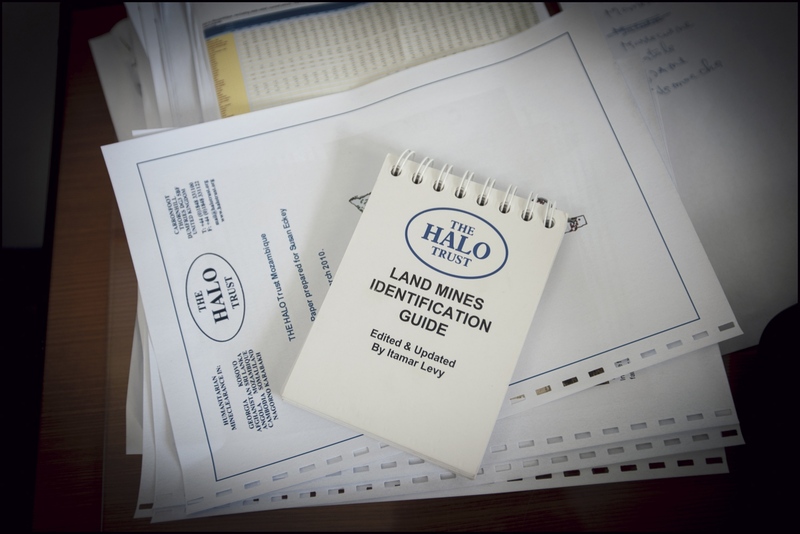 He formally briefs her on the situation in the minefield from the safety of the designated control point, which is part of HALO’s standard operating procedures at all its sites whenever and wherever they are visited in the world. After Kevlar flak jackets and ballistic visors are donned, the section supervisor starts to prime a pentolite explosive charge needed to destroy a Russian Federation PMN mine they have detected up in the field near one of the electricity pylons. "It is HALO policy to destroy every mine and each piece of unexploded ordinance it discovers. Then it is irretrievably gone, for all time." Gray explains as she monitors Onorio's progress with the explosive charge. The two walk slowly up into the minefield, the safe zones being clearly marked by red tipped sticks placed in the ground. "If you’re inside these markers then your safe", Gray points out. 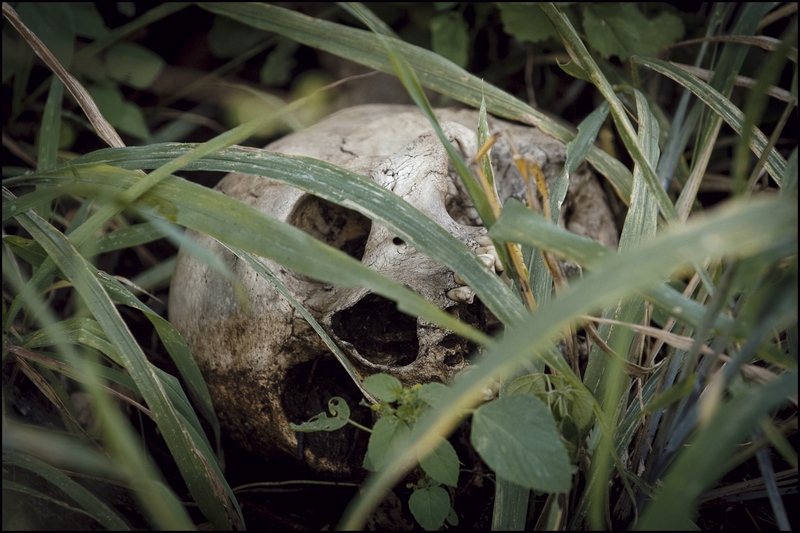 They solemnly pass the skeletal remains of two individuals whose death in this minefield's passed without ceremony long ago. 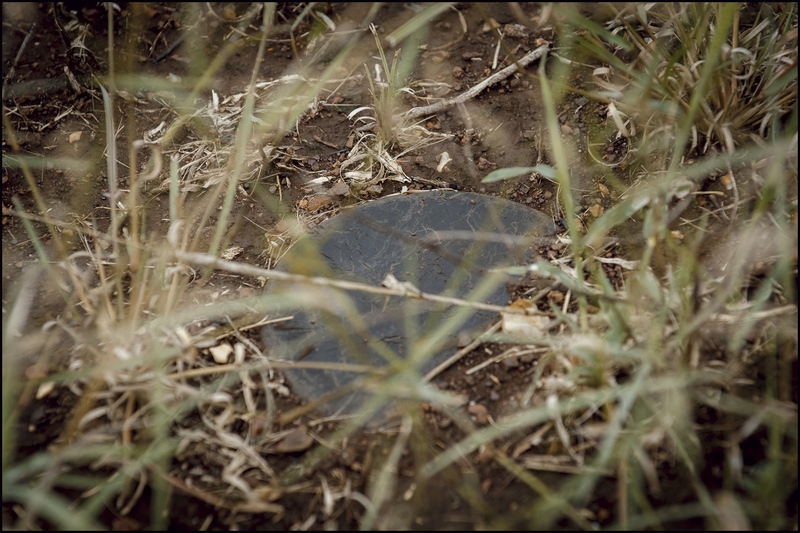 "They probably were trying to steal metal, stepped on one of he anti personnel mines planted here. Managed to crawl off some distance and then died alone. They've not from the local community and so haven’t been claimed. We're deciding at HALO and with the locals what we should do with them once we have completely cleared this area", Gray comments. A whistle blows giving the signal for the whole team in the minefield to withdraw to a safe distance as Helen's section supervisor lay's the charge. "You always do this alone", Helen explains, “One man one risk. “A fuse of five minutes has been chosen, ample time for the supervisor to join Helen at one hundred metres from the blast zone deemed safe for this type of landmine. The minutes are counted down then the seconds as the detonation time approaches. The noise of the bang hits you first followed by the site of a mushroom black plume of smoke pushing its way up into the sky as the explosive charge and the mine itself are destroyed. Then it is all over and Mozambique and Maputo province has one less mine.